This is the view of the tiny town of Arlempdes from the walkway that leads up to the castle ruins. You can see the back side of the church's clocher-mur (bell tower wall) in the center. There was very little activity in town -- we saw one guy doing some work outside the town's café/restaurant and the arrival of a fuel-oil delivery truck. 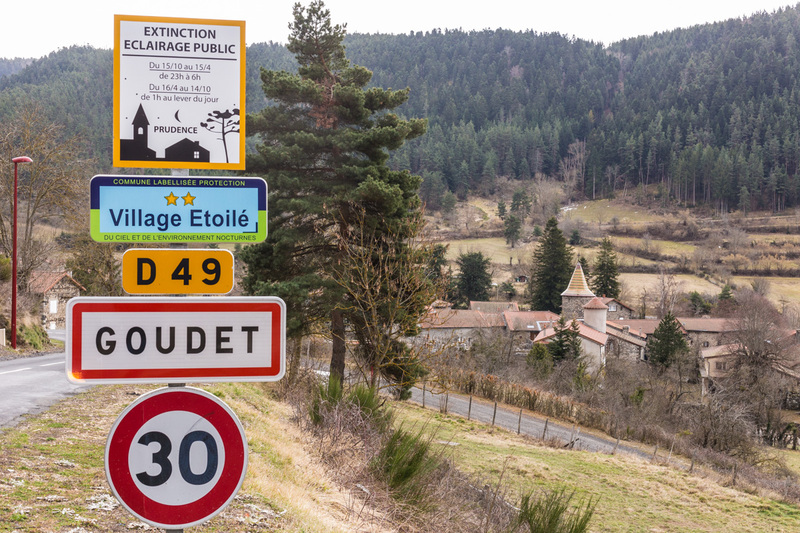 Arlempdes in March, almost a ghost town. I think it's more animated in summer. From what we could see, most of what remains of the château at Arlempdes are the exterior walls. There are various foundation elements visible, and the restored chapel is the only real building standing. Of course the place was closed for the winter season when we visited but, as I've said before, we weren't counting on going in because we had the dog with us. It's busy weekend for us here at home. We're both getting haircuts (mine was yesterday), I have an appointment with the dermatologist today, and we're going into town to the market on Saturday to get a rabbit for Sunday's lunch. I made the rounds of the garden centers on Thursday looking for some wooden stakes for the vegetable garden. I didn't find exactly what I wanted, but I did find a couple of parsley plants for the deck and some flowering plants for the window boxes. I'll be taking advantage of the nice weather this weekend to get them all planted. It's not fancy. 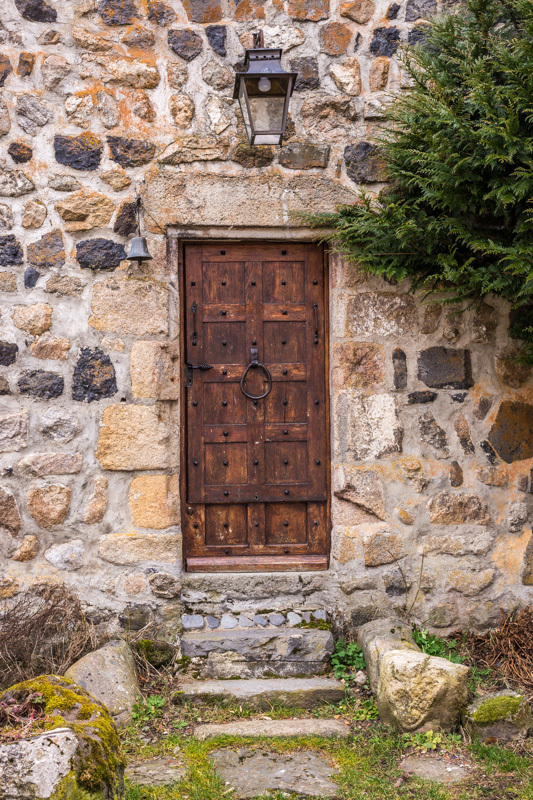 It's just a simple door on a house in Arlempdes. It does have a pretty big knocker. The bell is pretty cool, too. A door knocker in French is un heurtoir (from the verb heurter, to hit) or, according to Wikipedia, un marteau de porte (a door hammer). I learn something new every day. Back to the Auvergne! This is the church of Saint-Pierre in the small town of Arlempdes which, if you remember, is home to the first château on the Loire River. It was built in the twelfth and thirteenth centuries, and updated in the sixteenth. The overall style is romanesque. 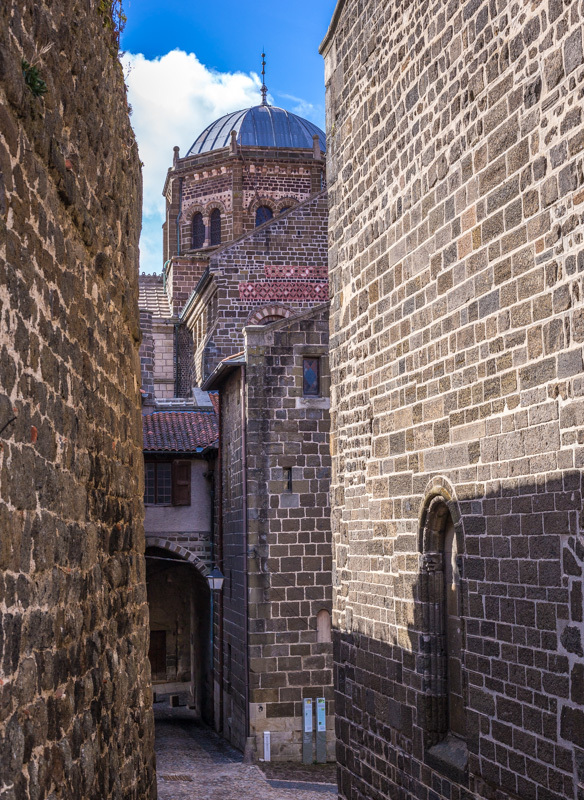 The facade of the church of Saint-Pierre seen through a portal in the city's ancient wall. 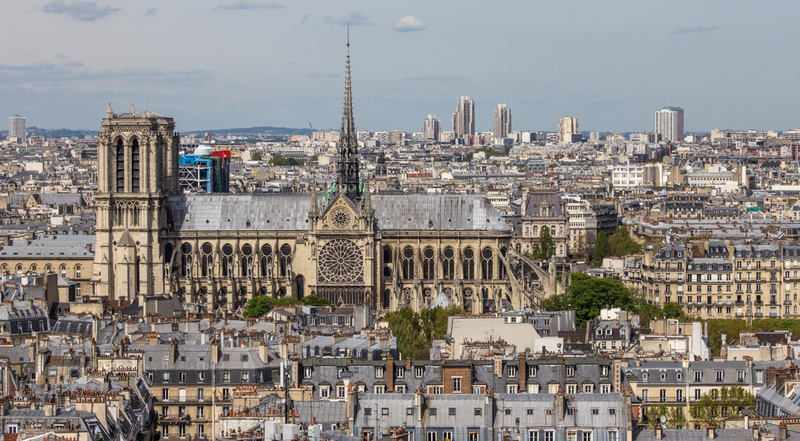 The church's bell tower is built as a clocher à peigne or clocher-mur, a flat, vertical wall with openings that contain bells. I've seen these before, but I didn't know until now what they are called. The church's bell tower, or clocher-mur, with three bells, but space for four. The church was locked up tight when we visited, so we didn't get to see inside. 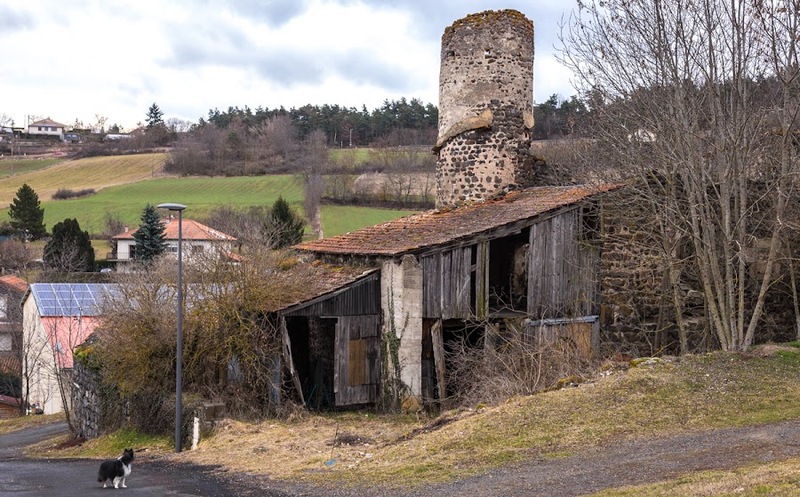 Now that our freeze threat is over -- it's warmer this morning than it was over the weekend and there are no smudge pots or hay bales lit outside our house -- we can get back to photos from our trip to Le Puy-en-Velay in the Auvergne. This is Arlempdes, a small hill town and ruined castle very close to the headwaters of the Loire. The castle walls blend into the rock and are hard to see. They're just above and to the right of the church's bell tower. This morning I woke up to the flickering light of smudge pots burning in the vineyard parcels to our north. The growers were up early to light them. On Saturday morning, another grower was out to the west burning bales of hay on the northern slopes of his parcels. The smoke was blowing over the vines when I walked Tasha just after sunrise. Smoldering hay bales produce smoke out in the western parcels. That grower told me that he measured -1ºC (about 30ºF) in his parcels. He didn't want to take any chances given what happened in April 2017 when a freeze killed a lot of the newly sprouted leaves. He is back again this morning re-lighting the hay bales. Burning hay bales at sunrise. The "smudge pots" used by the other grower are not true smudge pots. They're more like big candles, the size of a paint can, that are placed on the ground in the space between rows of vines. 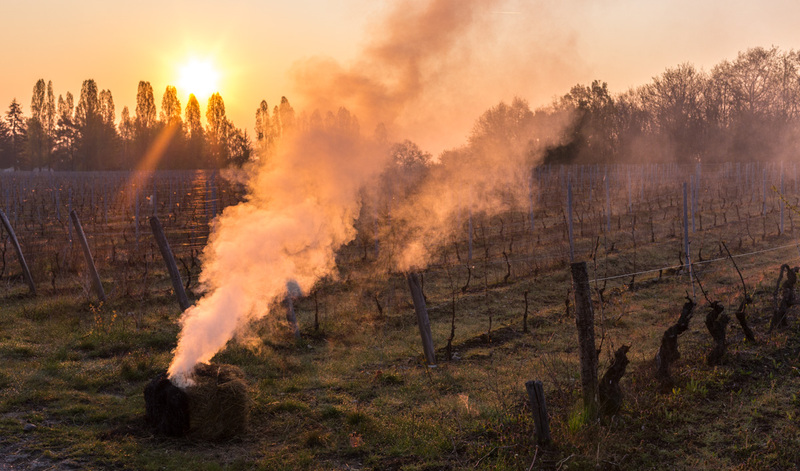 Like the hay bales, the burning candles produce smoke that blankets the vines helping to reduce heat loss and freezing. I also think they help to mix the air to increase the temperature on the ground, but I'm not sure about that. These two burning bales help to protect a parcel closer to our house. Other growers in our region use giant fans to help mix the air and prevent freezes. We can hear them to our north and south on these chilly spring mornings. They sound like helicopters, except that they never move. I wonder if they're not allowed in vineyard parcels that are close to populated areas, due to the noise. But I did wrap the fig tree. 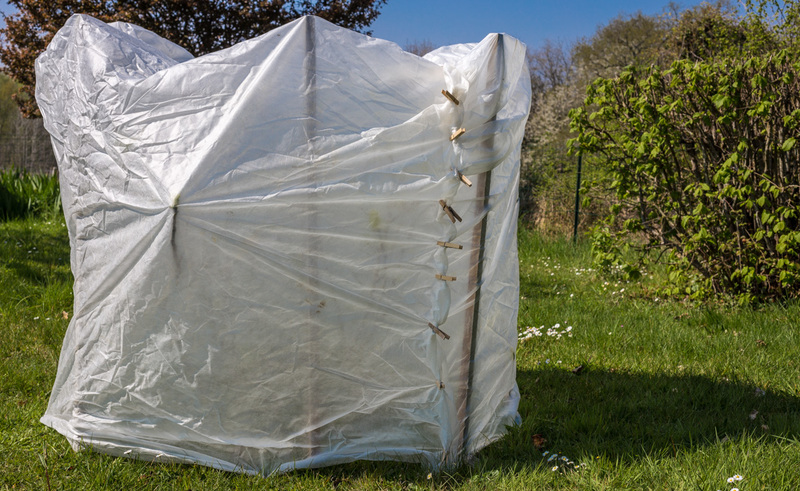 Because we're under the threat of a freeze this weekend, I decided to try to protect our fragile fig by wrapping it in gardener's fabric. This is the third time I have used the fabric on the fig, but it's the first time that I built a "cage" with wooden stakes to hold it. The tree was much easier to wrap this time. The fabric is wrapped around stakes that I pounded into the ground, then "secured" across the top and side with clothespins. We've had this fig tree for a long time, since 2006 I think. The winter of 2012 was especially cold and the tree froze all the way to the ground. I thought it had died, but it put up new stems the following spring. So six years of growth was gone, reset to zero. Two years ago this month we had an unexpected freeze. I had taken the fabric off the tree too early. The young leaves on the fig all shriveled and died and, while the tree eventually put out some leaves, there was no fruit. Last year I think there were three, maybe four, figs. So, with this weekend's predicted freeze, I wrapped the fig tree again. So far, the temperature hasn't reached freezing. But Sunday morning is supposed to be the coldest. We'll keep our fingers crossed. And, speaking of Christo, I heard on television that his next project is to wrap the Arc de Triomphe in Paris. I hope he has enough clothespins. This photo is not here but in the mountains south of Le Puy-en-Velay, taken more than a month ago. We found many of these little patches of snow on our excursions, laying low in shady places. Most of winter's snow was already gone, except on the higher peaks, which were quite white. Snow still hanging on in a roadside ditch near Arlempdes. We are not expecting any snow, but the low temperatures forecast for this weekend are at or below freezing. That's not good news for the grape growers; the vines are starting to leaf out now. I noticed yesterday the growers that own the vines around us put out smudge pots in preparation for a freeze. I don't know if they lit them this morning (Ken told me he heard their truck drive in around five this morning), but we'll find out soon. The coldest morning is predicted to be Sunday. I went out yesterday afternoon and wrapped the fig tree in a freeze-protective fabric. I hope it works. As you know, Ken, Tasha, and I spent the first week of March near the Auvergne city of Le Puy-en-Velay. 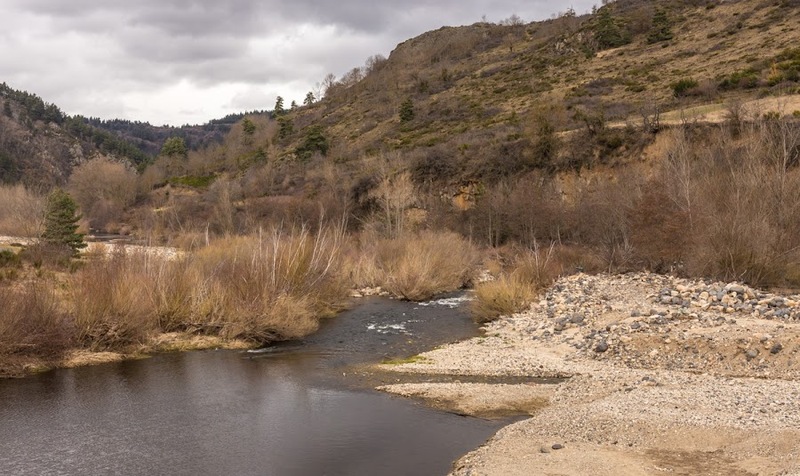 Not far from there, a little to the south, is the source of the Loire, France's longest river. 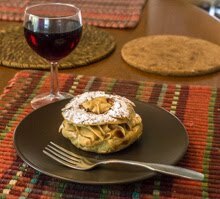 The Loire is small and swift near its mountain origins, and very different from the section that flows through our region farther north. 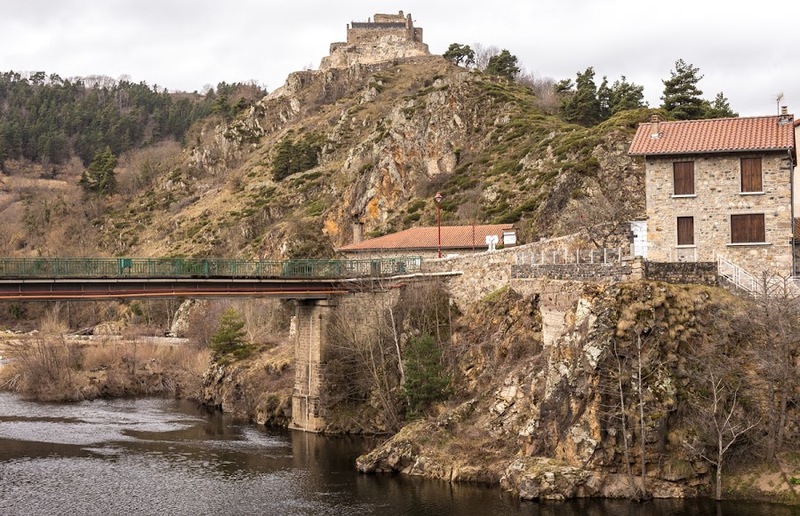 The Loire river cuts deep valleys in the Massif Central, France's central mountain range. The Loire we know is broad and calm and rolls along through gently sloping wine country. In the mountains, the river leaps down rapids and falls and carves deep valleys, almost ravines, in the rocky countryside. But all sections of the river, from its mountain source to its broad mouth in the Atlantic, have something in common: the châteaux (castles), perched on high points along its length. The ruins of the château de Beaufort, built around the year 1200, high above the young Loire at Goudet. In the mountains, the castles are mostly feudal medieval constructions, whereas the castles in our region tend to be royal renaissance works. Many of our local châteaux have medieval origins, but they were rebuilt as the renaissance flowered and the kings of France took up residence here. More and more rural towns are trying to save energy and reduce light pollution by turning off street lighting rather than leaving it on all through the night. This town, Goudet, in the Auvergne is one of them. The top sign says that public lighting will be turned off in winter between 11:00 pm and 6:00 am, and in summer between 1:00 am and sunrise. Central Goudet is down in its valley on the Loire River. 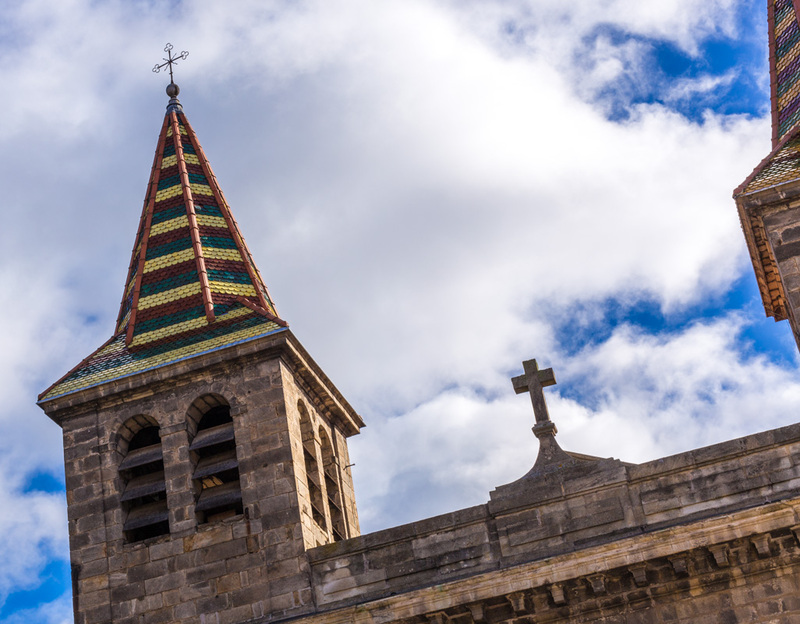 The church tower has a colorful conical tile roof. The second sign says that the town is a two-star town for their efforts to protect the nighttime sky and the nocturnal environment. Below that is the standard route number sign (the road we were on), then the name of the town (these are always placed at the town or city limits), and finally a speed limit of 30 kilometers per hour. If there were no speed sign, the town name sign means that speed is limited 50 kph. That's standard throughout France. Speaking of street lighting, we have none in our hamlet, thankfully. But on the next road over, we can see their streetlights through the woods in the evening. They also go off around midnight, so they're not shining through the night. 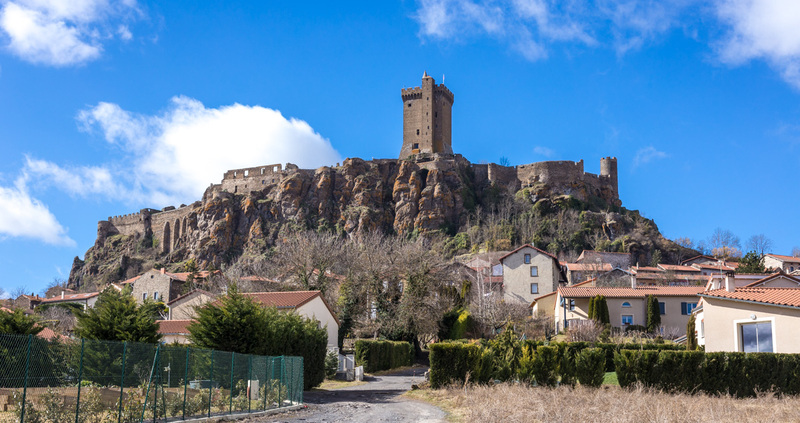 Just outside of Le Puy-en-Velay, atop another volcanic butte, is the medieval fortress of Polignac. Construction began on the château fort in the eleventh century. 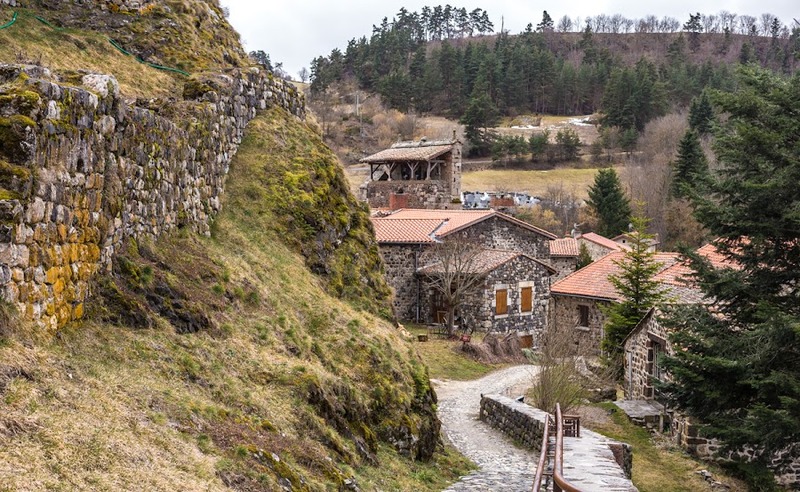 By the seventeenth century it had been abandoned, then used as a quarry for stone to build the neighboring towns. 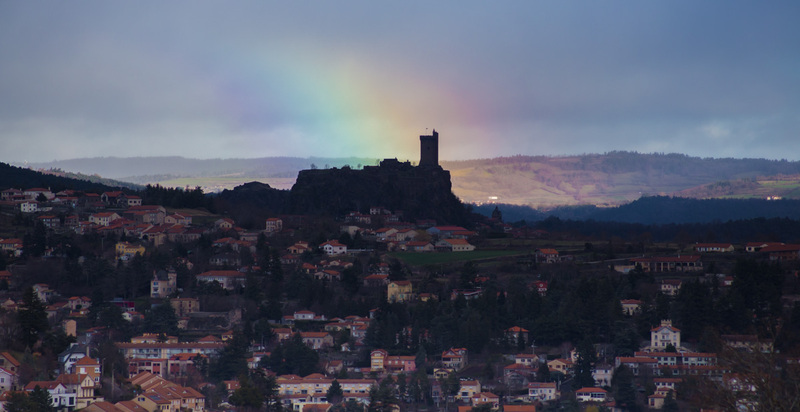 The forteresse de Polignac seen from a hillside in Le Puy-en-Velay. In the early nineteenth century, a descendant of the family that once owned the castle bought it back and began a restoration. 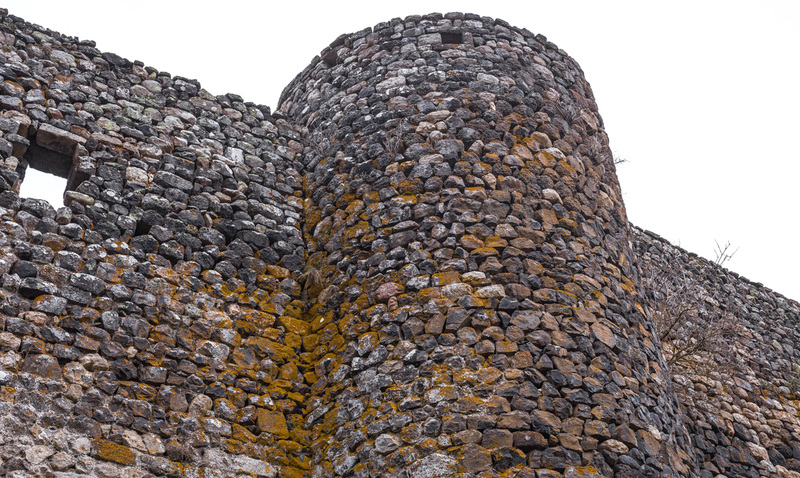 Since then, archeological research and further restoration has taken place and the castle and fortress have become a popular tourist attraction. Looking toward the west side of the fortress on its butte. Because we visited in March, the place was closed for the winter. I doubt that we could have taken Tasha inside even if the castle was open, so it didn't matter much to us. I took two of these photos from just below the castle, on opposite sides. The shot with the rainbow, such as it is, is a long zoom taken from much farther away in Puy-en-Velay. Looking up toward the donjon, or keep, on the east flank of the butte. 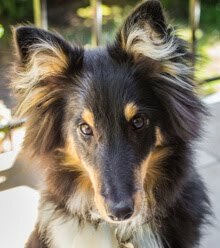 A funny thing happened last evening when I took the dog out. Our cat Bert was holding court in the back yard. He and three other cats were lounging in the grass near the vegetable garden. When I got outside, I noticed one cat scoot behind a hedge, but the other three just sat and watched us. There was another black cat and an orange cat. When I called Bert's name (from a distance, I couldn't tell which of the two black cats was him), he got up and started to walk over to me. The other cats stayed put, content to watch. Tasha and I left them in peace and went back into the house. 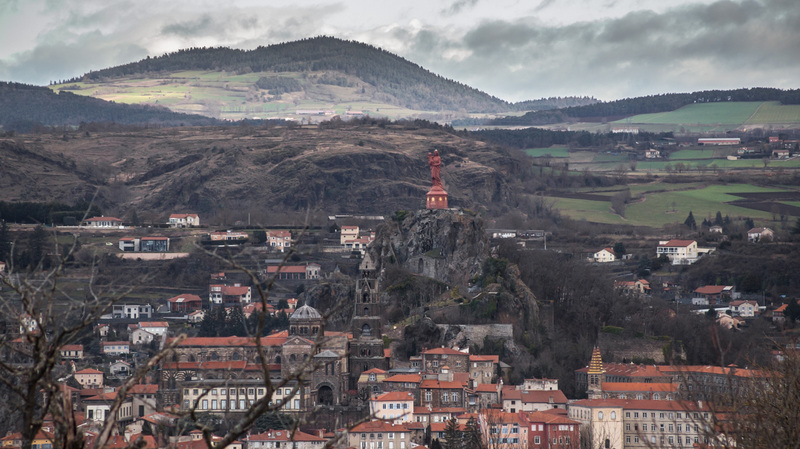 The small town of Aiguilhe, just north of the center of Le Puy-en-Velay, is built around an ancient volcanic cone that has been exposed by millions of years of erosion. 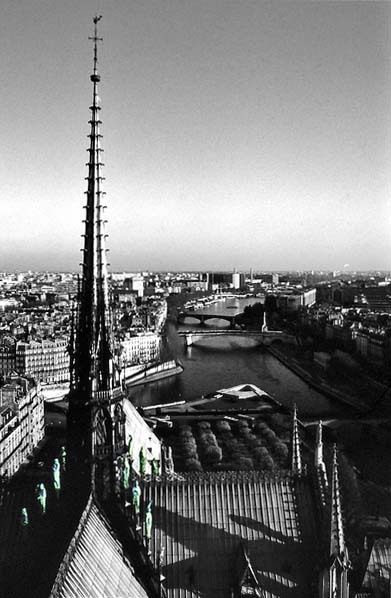 On top of the cone is a church named for Saint Michel. The church has been there in one form or another since the first century. 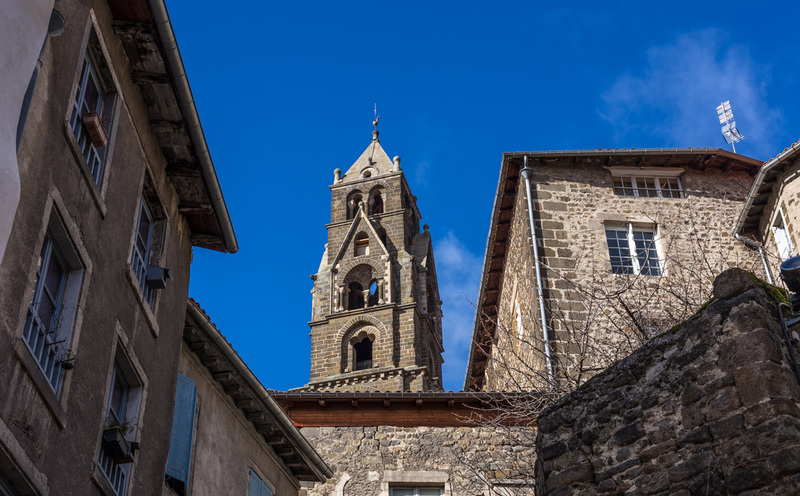 The church of Saint Michel in Aiguilhe, seen from a parking lot in Le Puy. The name Aiguilhe is a local term for a pointed summit, resembling a needle. The modern French word for needle is aiguille, pronounced roughly ay-GWEE-yuh. I believe that the two words are pronounced the same. 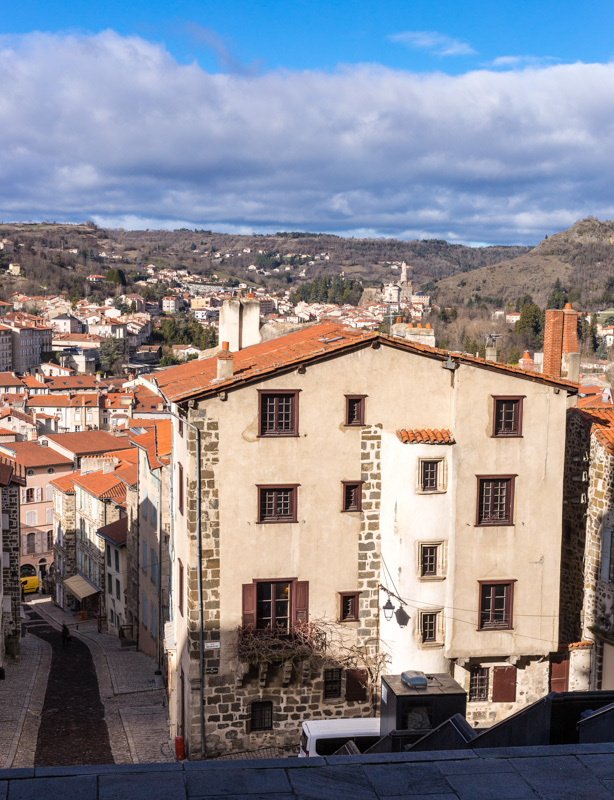 Here are views of a couple of the buildings near the cathedral in Le Puy. The first is a medieval tower, but I don't really know anything about it and my extensive lame research didn't turn up much. The second is a street shot of the colorful tile roofs on a church behind the cathedral. I think, if I'm not mistaken, that it's part of a larger institution called le Grand Séminaire Accueil Saint-Georges. It's a religious institution that welcomes and lodges pilgrims (historically) and general travelers (individually or in groups) for a modest fee. Colorful tiles on a church at the Accueil Saint-Georges. So, I think that's pretty much all from that morning walk in the center of Le Puy. We certainly didn't see everything and we would have had nicer weather (and more crowds) in the summer season, but we got a feel for the place. 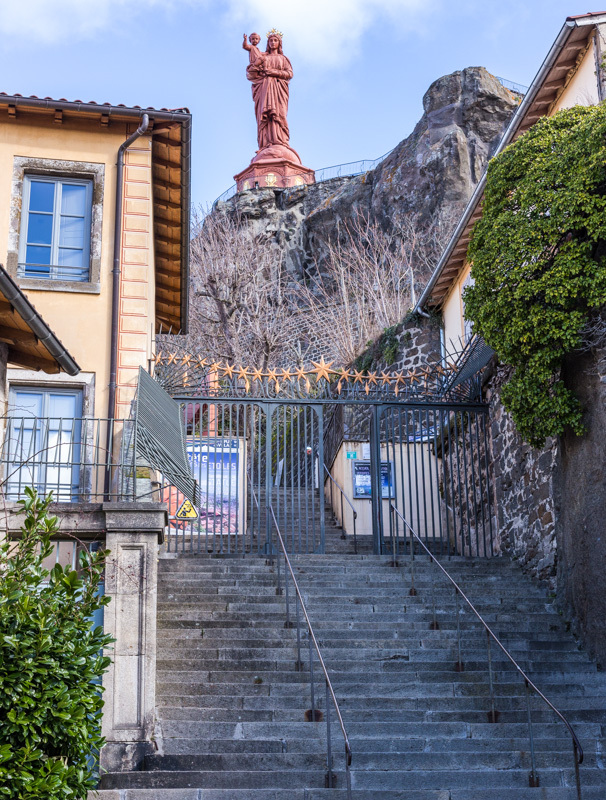 This cast iron statue dominates the city of Le Puy-en-Velay. It stands on the top of a basalt cone, the core of an ancient volcano. I read that it was made from melted canons captured during the battle of Sébastopol during the Crimean War in the mid nineteenth century. A view of the statue from one of the streets near the cathedral. On our walk around the cathedral, which sits below the statue, we were looking for the cloister. As it turns out, visiting the cloister requires an entry fee, and dogs are not allowed. So we continued walking toward the path up to the statue. They charge an entry fee too, but dogs on leashes are allowed. The entrance to the statue grounds and the stairs that go up, for a small fee. Since it was a chilly, windy day, and since our legs are not what they used to be, we decided not to climb the steep stairs up to the statue. Besides, it was getting close to lunch time. 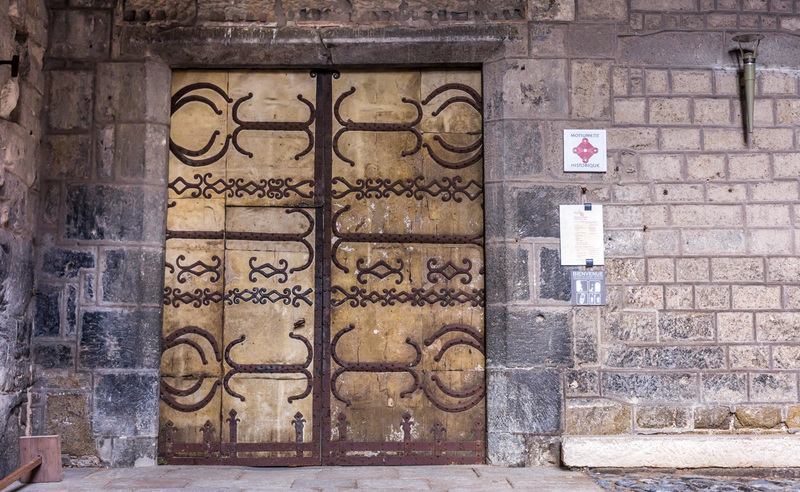 Here are a few of the doors I saw when we walked around the cathedral in Le Puy. I was impressed by the fancy iron work that adorned some of them. Which would you choose? Door Number One? The "freeze" we were expecting didn't happen, and it looks like everything made it without damage. The threat of a freeze or frost still exists. Officially, the risk of frost ends in mid May. Conventional wisdom says not to plant seedlings out until then. There's also a saying: En avril, ne te découvre pas d'un fil. En mai, fais ce qu'il te plaît (In April, don't remove a stitch. In May, do what you please). We have a busy couple of weeks. Somehow, Ken and I ended up needing prescriptions renewed at about the same time. That means doctor appointments for both of us. His is today, mine's on Tuesday. Then, he has a follow-up appointment with the dermatologist later this month. I'm going to see her in two weeks. There's only one dermatologist in our region, so getting an appointment can take months. When I called last week, she had an opening in April (I almost asked "what year? "), so I jumped at it. 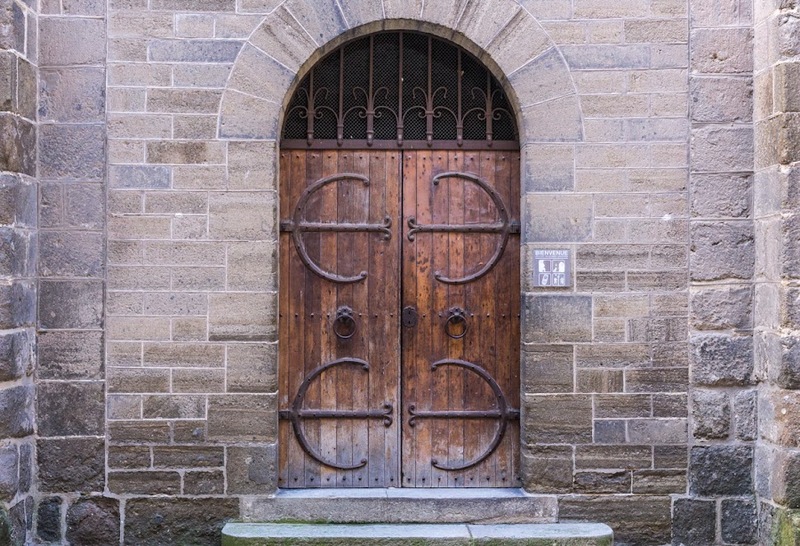 Or Door Number Three? Jeez, I feel like Monty Hall. It's also time to start doing the tax returns. Our French returns are due some time in May. The American returns aren't due until June (for Americans who live outside the US), but I'll probably do them at the same time as the French returns. That's been my pattern. This is the octagonal dome, or lantern, of the cathedral in Le Puy-en-Velay. It's built over the choir, where the transept crosses the main axis of the nave. 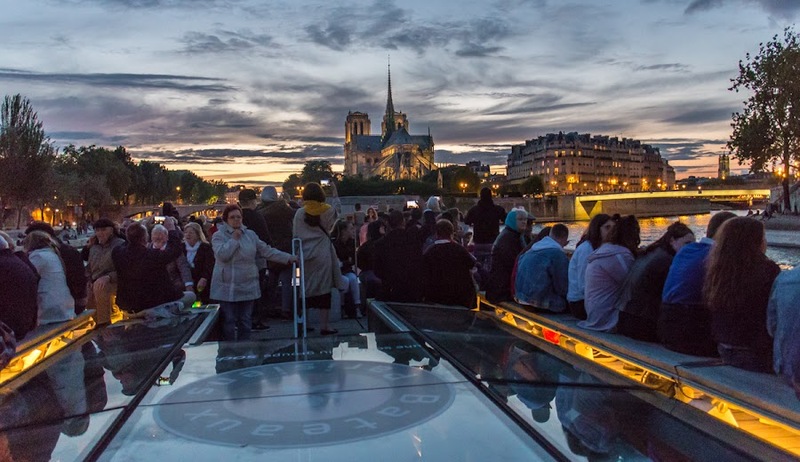 The purpose of a cathedral's lantern is to bring light down into the building, usually over the altar, hence the name. Looking south toward the cathedral and its dome. When we left the cathedral (the way we came in), we walked around it in the streets on its southern side. Since the cathedral is built on a hill, we were well below the floor level of the building. We continued around to the back and climbed back up the hill on the cathedral's north side, following signs toward the cloister. That's where we got this view. 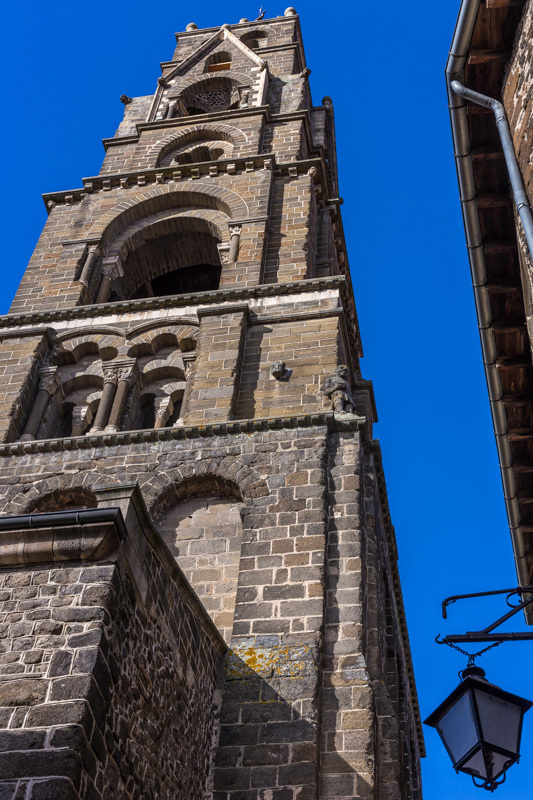 This is the bell tower at the cathedral of Notre-Dame du Puy. It's unusual in that it's not integral to the cathedral itself, and it was built at the rear of the building rather than at the west entrance. From what I've read, the tower is 56 meters (about 184 feet) high, with seven levels. 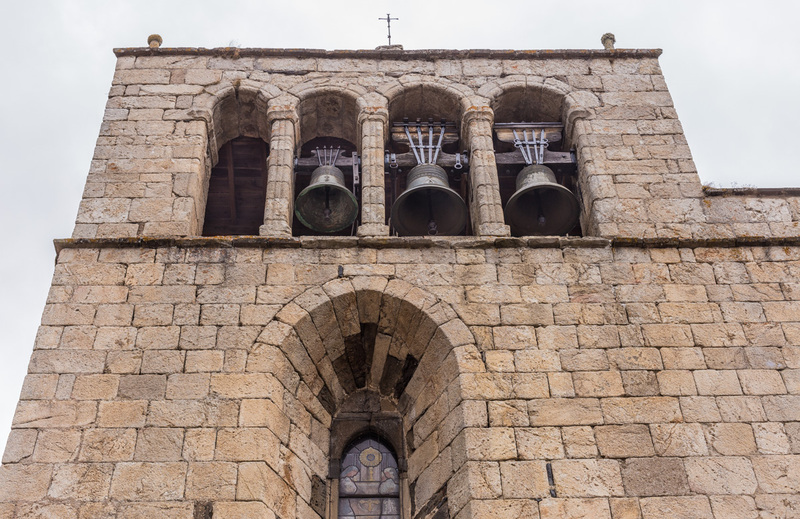 There are four bells installed at the top of the tower. The cathedral's bell tower rises high above the surrounding buildings. Our weather is cooler and wetter than it was a couple of days ago. We may have a light freeze on Thursday morning, so we have to keep an eye on the forecast. I may decide to cover the fig tree so that the young buds don't get damaged. A closer view from a neighboring street that winds around the cathedral. And, by the way, I have four zucchini sprouts and several tomato sprouts (so far) in the greenhouse. And the snow peas that I planted out in the garden a couple of weeks ago are sprouting as well. They should survive a light freeze. I hope. After all, they were intended to be sown between February and April. It's not the biggest organ in the world, or in Europe, or in France. Not by a long shot. I looked up the list of the world's biggest pipe organs, and this one was nowhere to be found. Not surprising, but I had to check. Its intricately carved buffet (the wooden casing that holds the pipes and other organ components), however, was declared a national historical monument in 1862. So, size apparently doesn't matter. 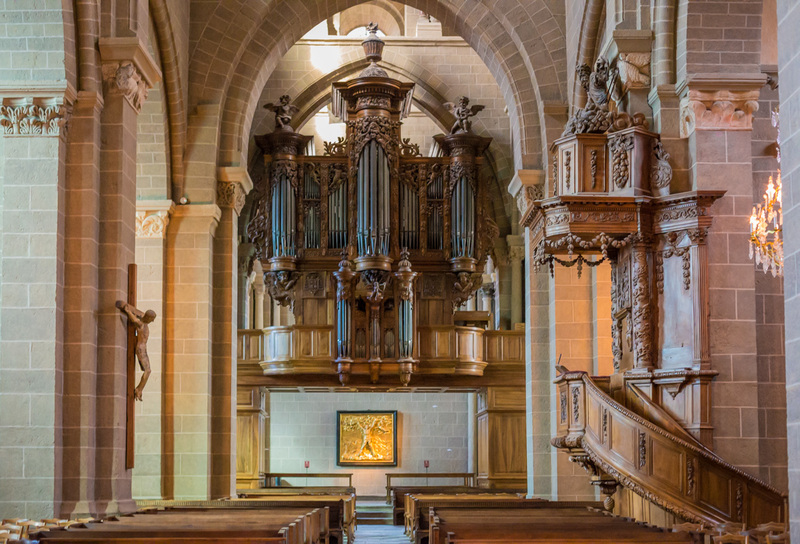 The organ in Notre-Dame-de-l'Annonciation du Puy-en-Velay was last restored in 1999. Our weather is changing. Again. Our beautiful spring days are going to be interrupted by a cooler weather system through the weekend. Rain, and maybe some freezing temperatures are predicted. 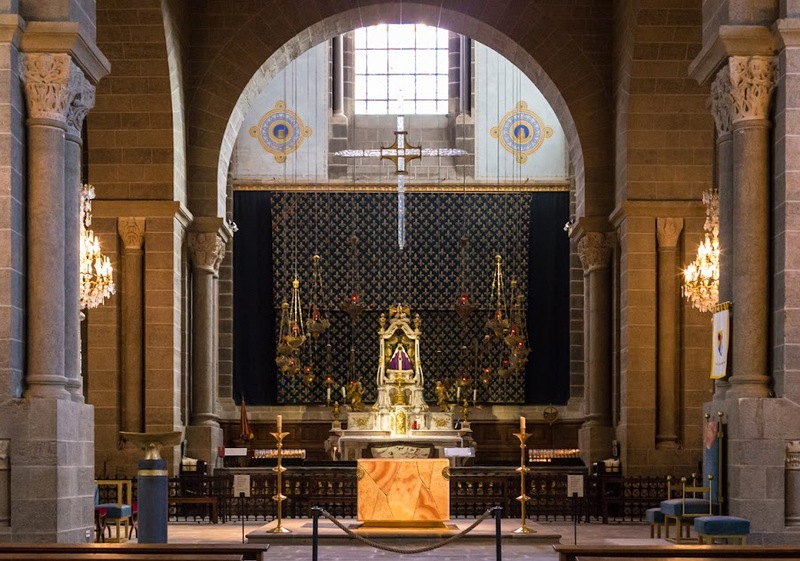 Ken finished his quick look inside the cathedral of Le Puy-en-Velay and it was my turn. It's a big place, but without the soaring volumes of a gothic cathedral. The massive dark stone gives it a heavy feel, almost bulky. Still, there was enough light from the stained glass windows that I could snap a few photos inside. The nave, looking toward the altar. I did a quick walk around the nef (nave) and up to the autel (altar) and chœur (choir) before heading back out to meet up with Ken and Tasha. A closer view of the altar. The statue in the center with the purple robe is la vièrge noire (the black virgin). 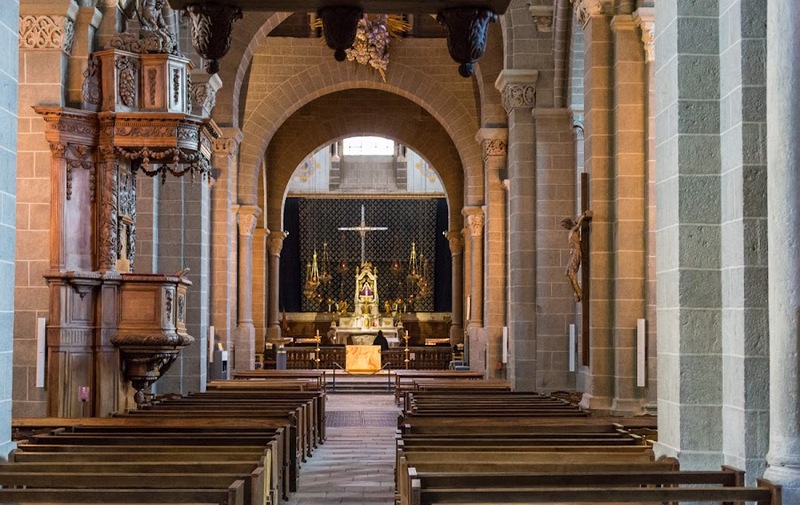 It occurred to me that I've probably spent more time visiting churches in France that I ever did going to church growing up. In the immortal words of Maude Findlay, "God'll get you for that, Walter." While I waited on the cathedral's porch, I looked up and saw that I was being watched by gremlins. In this case, the gremlin looks like a sheep. 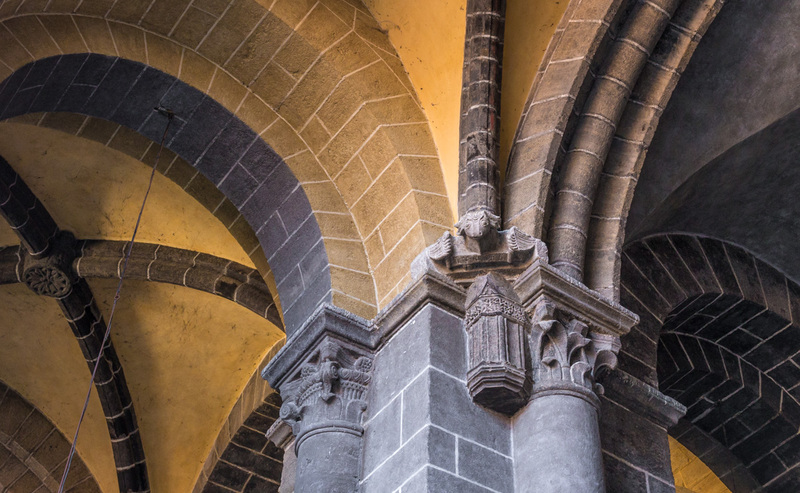 The column capitals are beautifully carved and some of the arches are adorned with colorful paintings of what are probably saints. The dark volcanic stone is prominent throughout the cathedral. Saturday was a beautiful day here at home. I got the deck power-washed and ready for summer. The table and chairs are set up for sitting and the grill is uncovered. I can't wait to grill the season's first steak! Once we made it up the hill to the cathedral, we faced two steep staircases to reach the entrance. A little more effort and we were on the porch looking westward. 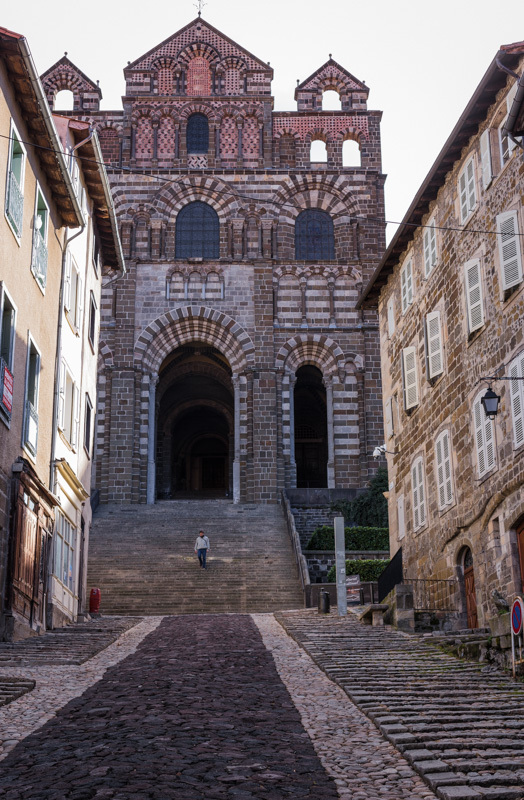 The west front of the cathedral in Le Puy-en-Velay. 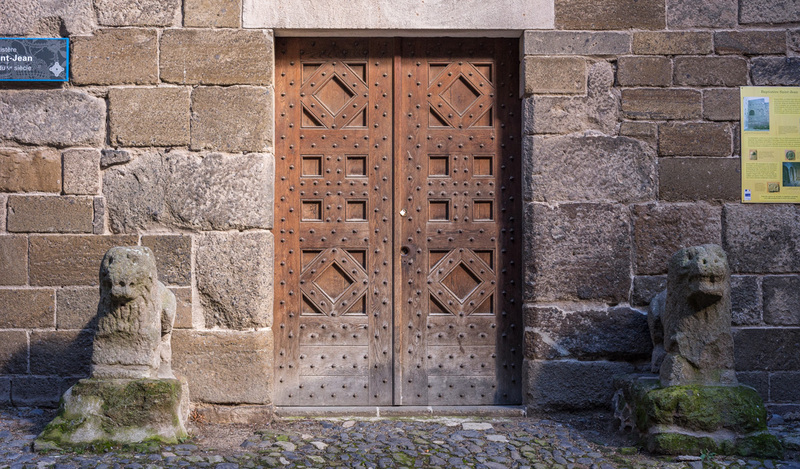 The front doors of the cathedral were locked, and the stair to the cloister was gated shut. I waited on the porch with Tasha while Ken went around the south side looking for an entrance. Looking westward from the cathedral's porch. He found the entrance near the transept and went in for a look. When he was done, he stayed with the dog while I went inside. 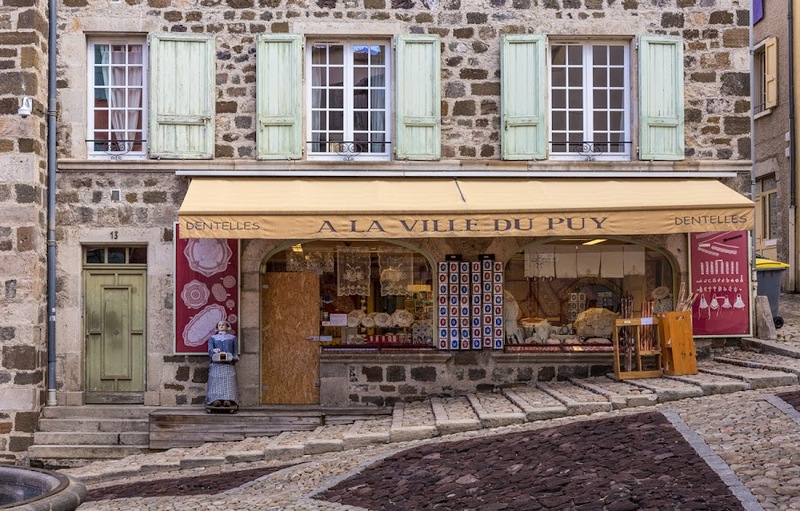 Le Puy-en-Velay is famous for three products: la lentille verte (green lentils), la verveine (verbena liqueur), and la dentelle (lace). The city's situation as a major stop on the pilgrimage route(s) to Saint-Jacques-de-Compostelle helped to spread its reputation and products around France and the rest of Europe. 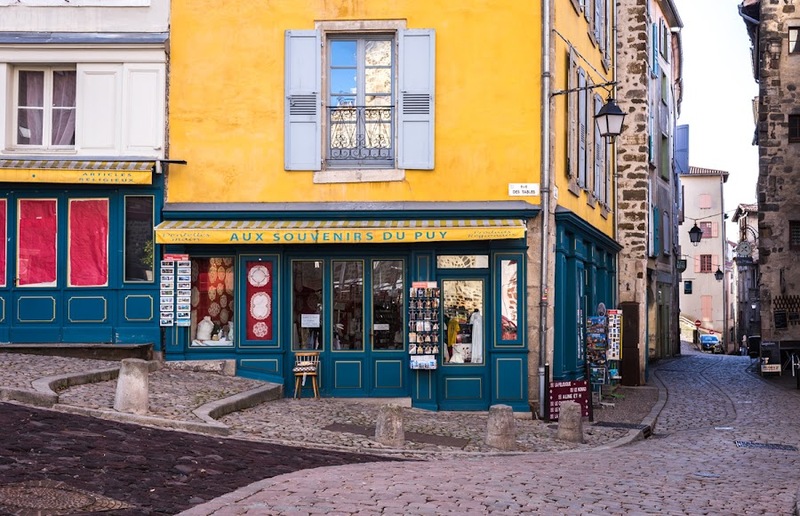 A lace shop in the center of Le Puy. Looks like they've had a problem with the door. I got some major (for me) work done in the back yard on Thursday. One section of the "lawn" grows thick and fast in the spring. It had to be cut. But first I had to pick up winter's fallen branches and twigs. Then I had to change the oil in the lawnmower. And finally, I had to wait for the morning dew to dry up. But I got it done and now the grass looks better and will be easier to cut when I get to the rest of the lawn. 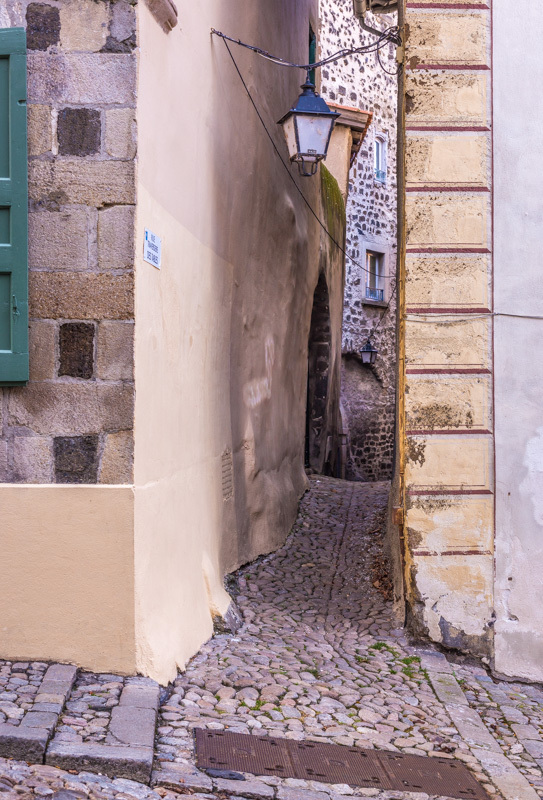 Some streets in Le Puy-en-Velay are narrow. Very narrow. This one is called la rue traversière des Tables. I think that probably means something like The Tables Street Transverse, a street that intersects the rue des Tables and creates a short cut to another street. La rue traversière des Tables connects the rue des Tables and the rue Adhemard de Monteil. I only know of the usage of "transverse" in English from New York City. There are four streets that cross Central Park from Fifth Avenue to Central Park West: 65th, 79th, 86th, and 97th. Where they cross the park they are called the 65th St. Transverse, the 79th St. Transverse, and so on. I imagine the word traversière has a similar meaning. 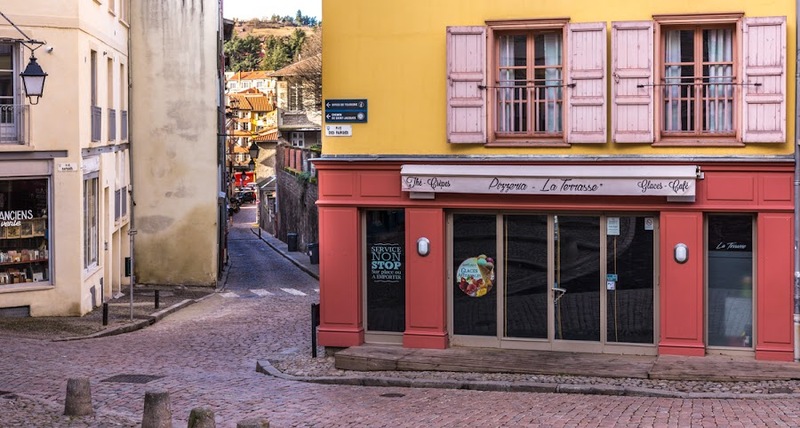 While we walked through the maze that is the old center of Le Puy, little views opened up here and there out over the larger town. That's because the old center is built on the side of a hill. Streets wind up and around the hill toward the cathedral offering pedestrians little slivers of the view below. The newer "ville basse" (lower city) is built at the foot of the older "ville haute" (upper city). Mmm, pizza! And yes, there are still cars in the old center. Most of the streets are single lanes and one-way, but people live in town and need access to their homes. Not to mention businesses that need deliveries and refuse that needs to be removed. Some of the streets have access bollards that only residents can activate. This is not a part of town you want to drive around to see. Best to park below and walk up. The first goal of our morning walk in Le Puy (besides parking the car) was to get to the cathedral. The path was pretty clear from the map and soon we were staring up at the west front of the building. 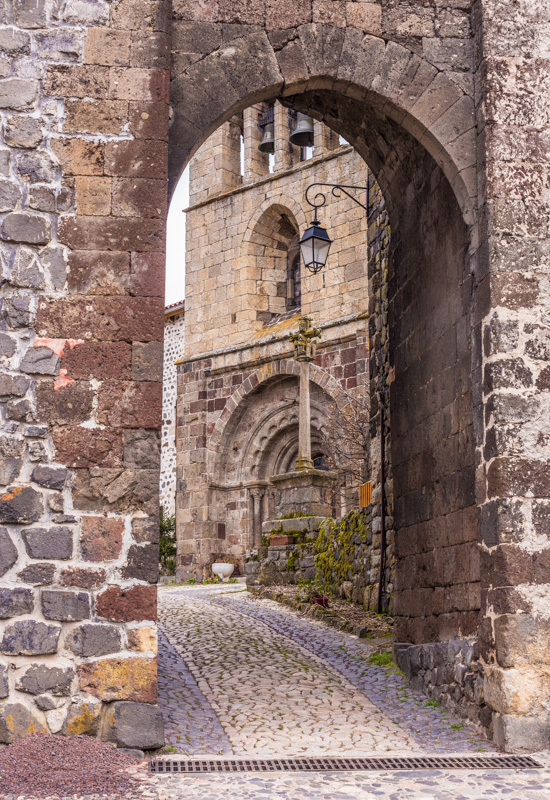 The romanesque cathedral was built between the 11th and 13th centuries. We still had a climb ahead but it wasn't too difficult. We took our time, and took photos along the way. 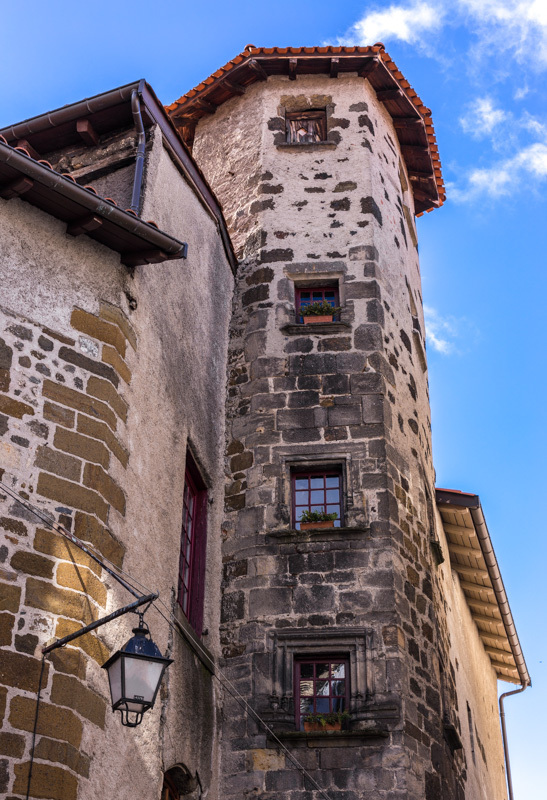 Le Puy-en-Velay is not the most picturesque city I've seen, but it has plenty of interesting nooks and crannies to explore. We parked in a lot on the boulevard that circles the old town and walked in, and up, toward the cathedral. A souvenir shop selling postcards, of course, along with lace and probably lentils, both products for which the city is known. There were people around, but it was not crowded. That may be because we were there on a Thursday at around ten in the morning. People would have been at work or in school and not wandering the streets. I imagine that there are plenty of tourists in town in the summer months when the weather is good. While we were there, in March, the days were chilly and windy. 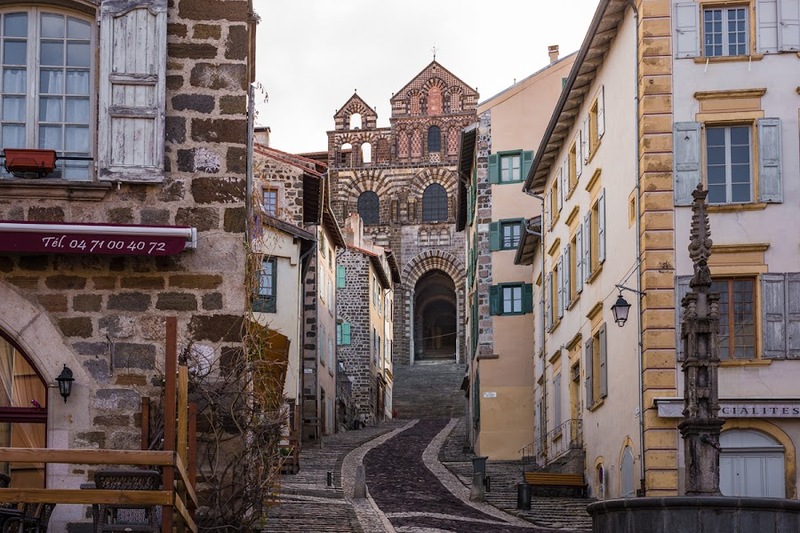 This is the central part of Le Puy-en-Velay. You can see the south side of the cathedral, its tower and dome, hugging the hillside. 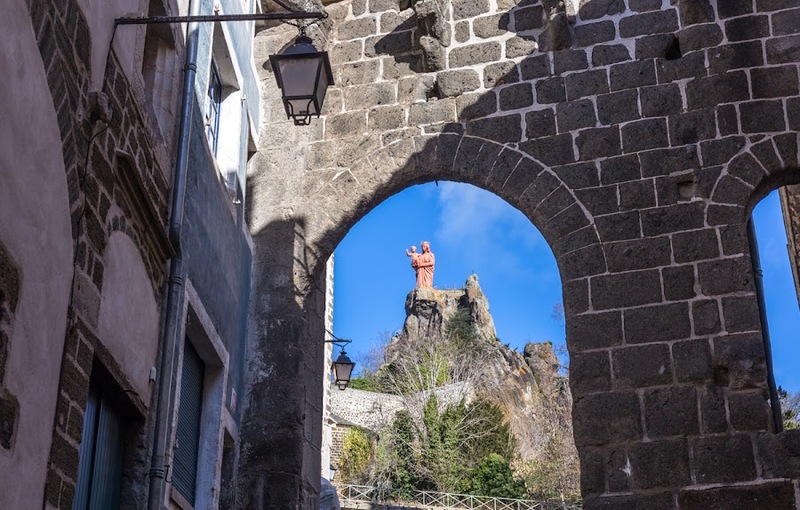 On top of the volcanic rock formation is the much larger than life statue of Notre Dame de France. It's made from cast iron and dominates the city. There's a stair that visitors can climb up to the base of the statue, but we didn't take it. There's an admission charge, and we really didn't feel up to the climb after having just "climbed" up into the central part of town. Plus, we had the dog with us. And it was chilly. Excuses? I got a million of 'em. You can see the stair winding its way up from behind the cathedral to the statue up on the rock. Saturday was as nice as predicted and we got outside for a while. I got the snow peas planted and Ken harvested the kale that overwintered in the garden. He's cooking it up this morning and will put it into the freezer for future meals. 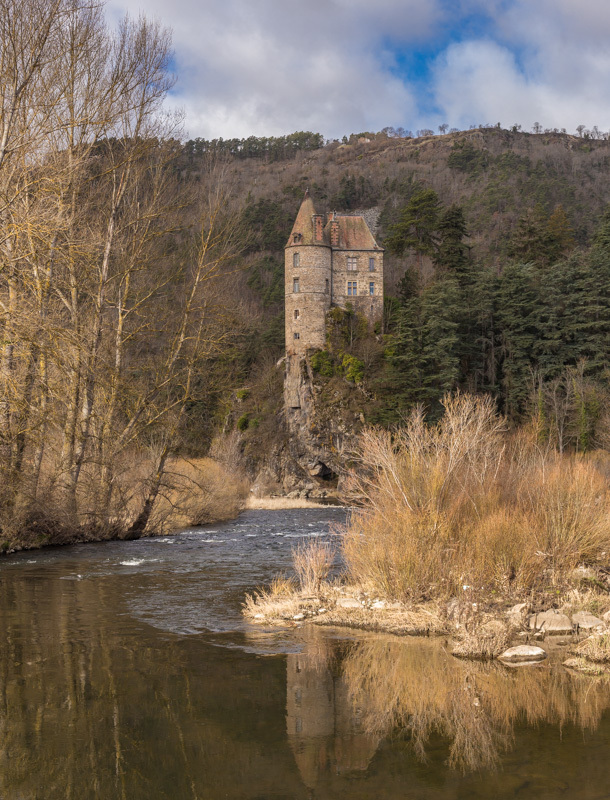 The château rises from a bluff above the Loire, a much narrower river this close to its source. The view is of the eastern end of the castle. You can easily see that the castle is a narrow building, much wider in one dimension than the other. Poor Tasha had to stay in the car while we adventured to the photo spot. Having just had a walk, she didn't mind too much. On the home front, I made some progress in the garden on Friday. I got the small tiller out and tilled the soil along the back edge of the vegetable plot. Then I put up the fence that will serve as a trellis for a crop of snow peas. I plan to plant some of the seeds today. I also trimmed down last year's oregano, daisies, and Jerusalem artichokes to make way for new spring growth. Except that this part of the Loire Valley is about 400 kilometers (a four-hour drive) from our part of the Loire Valley. 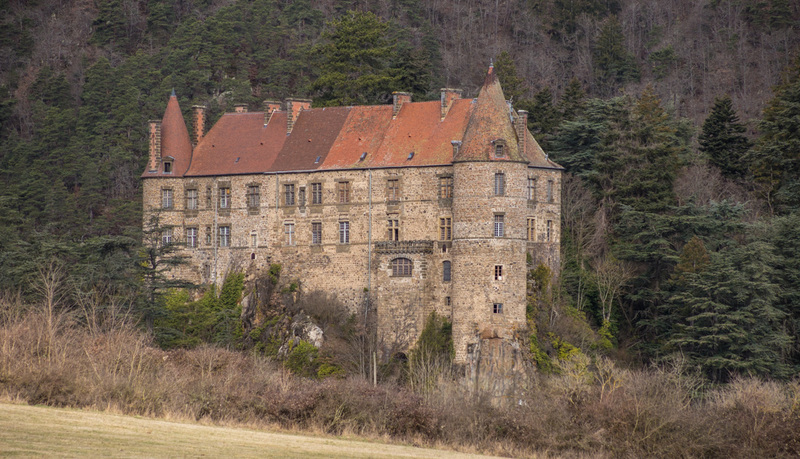 Just north of Le Puy-en-Velay is the town of Lavoûte-sur-Loire, and just outside of town is this rather large château, Lavoûte-Polignac. 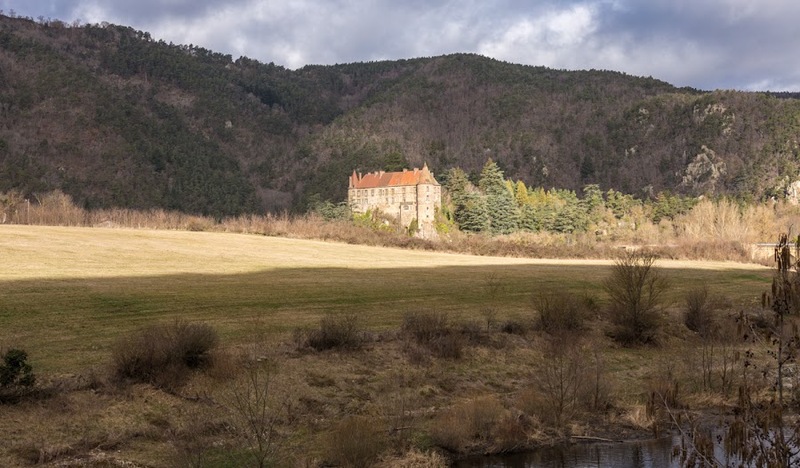 The château sits in the deep valley carved by the young Loire River in the mountains of the Auvergne region of France. We drove up to the grounds and parked and took a walk, with Tasha, right up to the front door, which was locked up tight. The castle was closed to visitors for the winter. We hadn't planned to go inside, but it would have been nice to get into the courtyard and see the front of the place. Oh well. Entering the town of Lavoûte-sur-Loire. 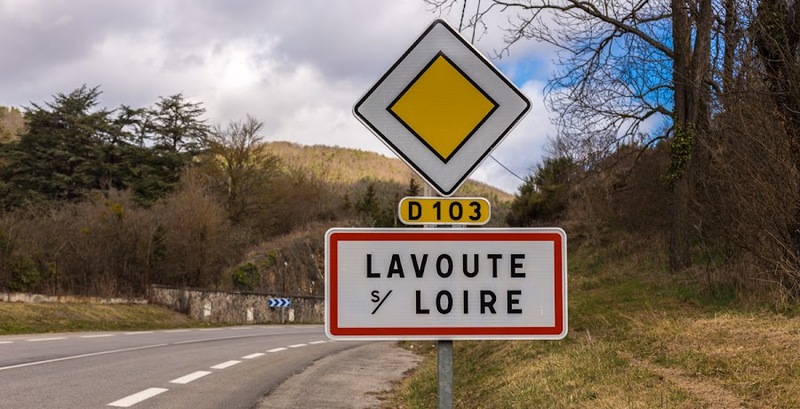 When you enter any town in France, the speed limit becomes 50 km/h unless otherwise posted. The yellow diamond means we have the right-of-way on this road. Still, we were able to see the castle's back side by getting some distance and taking photos from across the river. 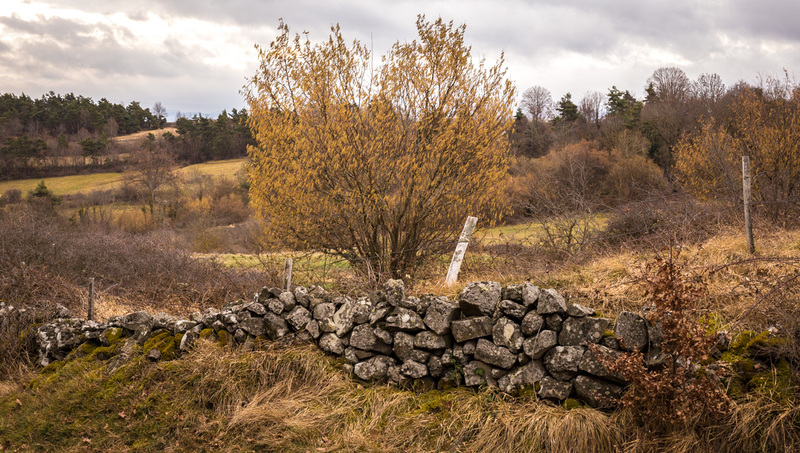 I liked how this crumbling stone wall looked against the hillside. I passed it on one of my morning walks with the dog, up the hill behind our gîte. The mornings were chilly, but not really cold. Even so, we saw some patches of snow in shady places. You can't see them in this photo, but there were cows grazing in the pasture on the upper left. I have many more photos of the trip to the Auvergne to share. I'm trying to balance them with the pictures that Ken is posting so that we're not showing the same thing at the same time. Not that it matters much. We see things in different ways most of the time. 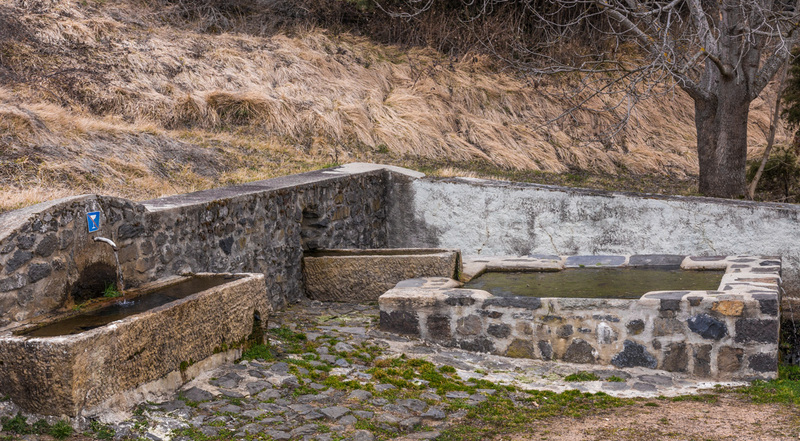 This is a spring up on the hill behind the house we rented in Le Puy-en-Velay a couple of weeks ago. It's quite a fancy setup, with two flows and stone basins to hold some of the water before it runs out to a stream. We saw a couple of similar springs around, all with the "non-potable, do not drink" symbol. I wonder what, if anything, the water is used for, or if the whole thing is just a remnant from another time. 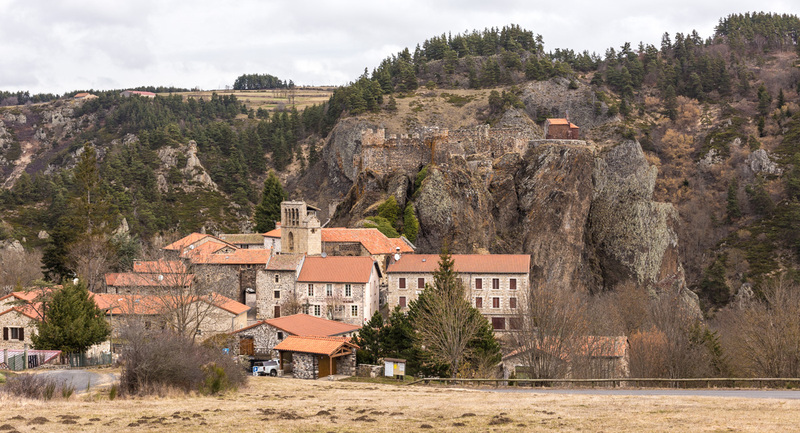 Water springs forth from the ground in the volcanic hills around Le Puy. A spring is une source in French. As opposed to spring, the season, which is le printemps. Or spring, the coiled bouncy thing, called un ressort. A little more Tuesday than Tasha this week. There she is outside the gîte in Le Puy-en-Velay during one of our morning walks two weeks ago. The part of the building we stayed in is not visible in this shot; it's behind the ruins of the barn and dovecote. Tasha wonders what's inside that old barn. A cat? A rat? A pigeon? I'm cat sitting this week. One of our neighbors went down south for a few days to see her daughter and new grand-daughter. I go over to her house to let the cat in and out and feed her (the cat) twice a day. This is the neighbor who did the same for Bert while we were away.